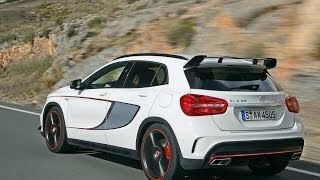 Mercedes-Benz has released details of the exclusive GLA Edition 1, a new compact SUV which will add new emotional variant to the comprehensive SUV range. 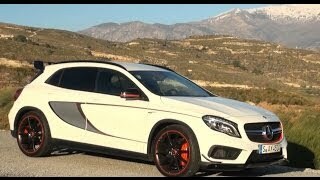 The new GLA Edition 1 exterior is based on the Urban line with simulated underguard and roof rails in chrome. 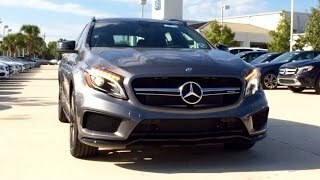 Other features include bi-xenon headlamps, black radiator grille louvre with chrome inserts, black-painted exterior mirrors, black waistline trim strips, dark-tinted glass and 19-inch AMG light-alloy wheels finished in high-gloss black. The model will be available exclusively in cirrus white, orient brown metallic, mountain grey metallic and designo magno mountain grey. The special model is recognisable thanks to the "Edition 1" lettering on the front wings. The cabin is equipped with seats which are upholstered in nut brown leather and Alvorada fabric with striking moccasin stitching, a flat bottom steering wheel, stainless steel sports pedals, aluminium trim, black roof liner and cord floor mats. Also comes is a Light and Sight package that includes ambient lighting, illuminated door sill plates and automatic windscreen wipers. There is an option of four engines which include a 1.6-liter four cylinder with 156 HP (115 kW) and a 2.0-liter four-cylinder with 211 HP (155 kW). Other two are the 2.2-liter diesel engines with outputs of 136 HP (100 kW) and 170 HP (125 kW). 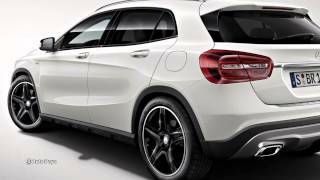 The 2014 Mercedes GLA Edition 1 will be available for pre-order from the end of November and the first deliveries are scheduled for March 2014. Pricing details are not available, however it is expected to be priced around $45,000 (29,000 euros).